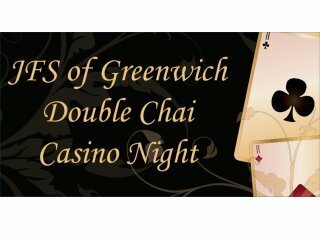 Please join us for a Casino Night to remember, in support of the Double Chai anniversary of Jewish Family Services of Greenwich. Be a part of an organization that has been changing lives for 36 years. Your presence will help JFS of Greenwich continue to provide mental health and support services to those in need in the Greenwich community and beyond. Our Double Chai Casino Night will be a festive party with a delicious sushi bar, passed hors d'oeuvres, yummy desserts, and thirst-quenching cocktails along with our incredible Casino! Individual Ticket -- includes $250 in Casino Bucks! Register by April 18, 2019 and double your Casino Bucks from $250 to $500! Table -- includes 10 tickets and $2500 in Casino Bucks! Register by April 18, 2019 and double your Casino Bucks from $2500 to $5000! Double Chai Sponsor -- includes 1 ticket and $360 Casino Bucks! Register by April 18, 2019 and double your Casino Bucks from $360 to $720! Call 203-622-1881 or email [email protected]. 1 Holly Hill Lane, Greenwich, CT 06830 US.